What is RecoveryFix for Exchange Server Recovery? RecoveryFix for Exchange Server is an Exchange Server Recovery Software capable of recovering and retrieving all data from corrupt and damaged Exchange database files and places them to various storage hubs, applications, and formats, namely PST, Office 365, and Live Exchange. With RecoveryFix for Exchange Server, users can do more than just recover damaged and corrupt EEDB files. For one, it can scan and recover every item from a damaged mailbox, including items that are deleted. The software can recover OST and PST files, migrate entire mailboxes to multiple locations, export items to various formats, and perform backup recovery from exchange backup files. RecoveryFix for Exchange Server Recovery delivers a powerful server recovery platform that can scan and recover mailboxes from critically damaged or corrupted EDB files without any loss of data. Intact and in full health, recovered mailboxes retain their tree structures as it was saved in the Exchange system. Even deleted mailboxes and items that you thought are gone can be retrieved and restored complete with all the details. Aside from recovering items from damaged and corrupted EDB files, RecoveryFix for Exchange Server Recovery lets you migrate your EDB files to different destinations with ease, thanks to its simple drag and drop interface as well as its copy and paste options. You choose which files you want to relocate and move them to Office 365, Outlook profile, or Live Exchange. Filters allow you to implement certain specifications, such as Item Types and Date Range. RecoveryFix for Exchange Server Recovery Software lets you export specific mailbox items to apps, systems, and other data storage hubs in PST, EML, and MSG formats. Data integrity remains intact as the software migrates every mailbox item complete with all its metadata and other properties. You can export your data with full confidence and not worry about data loss. Migrates Offline EDB to Outlook PST. Export mailboxes to Live Exchange. Migrate mailboxes from Live Exchange to Office 365. Export Office 365 mailboxes to Live Exchange. Export Public folders & Archive mailboxes to Exchange or Office 365. Generate a preview of entire mailbox data before exporting. Offers e-discovery of specific emails and its content to users. Allow users to perform selective data migration. Runs on all versions of Windows OS. What Problems Will RecoveryFix for Exchange Server Recovery Solve? A. Repairs damaged EDB data and restored it in PST. Whenever you have damaged EDB files, and you are unable to access its data, then use this Recoveryfix for Exchange Server. This tool is designed with an advanced algorithm that lets its user’s repair Damaged EDB files and migrate them to PST. B. Allows the user to perform e-discovery with the inbuilt search feature. With this tool, you can also perform e-discovery. This software is embedded with multiple searching criteria that offer you a deep down search. You can search with General criteria, Mail Properties, Attachments and more. C. Migrates Public folders and archive mailboxes to Live Exchange or Office 365. RecoveryFix for Exchange Server allows users to migrate public folders and archive mailboxes of Live Exchange to office 365 or vice versa. There are popular and widely used solutions in each software group. But are they automatically the best fit for your company’s special wants? A market-leading software product may have thousands of subscribers, but does it provide what you need? For this reason, do not blindly spend on popular systems. Read at least a few RecoveryFix for Exchange Server Recovery reviews and mull over the elements that you wish to have in the software such as the cost, main features, available integrations etc. Then, choose a few solutions that fit your wants. Try out the free trials of these platforms, read online comments, get explanations from the seller, and do your research meticulously. This exhaustive research is sure to assist you select the most excellent software solution for your company’s specific wants. How Much Does RecoveryFix for Exchange Server Recovery Cost? We realize that when you make a decision to buy Communications Software it’s important not only to see how experts evaluate it in their reviews, but also to find out if the real people and companies that buy it are actually satisfied with the product. That’s why we’ve created our behavior-based Customer Satisfaction Algorithm™ that gathers customer reviews, comments and RecoveryFix for Exchange Server Recovery reviews across a wide range of social media sites. The data is then presented in an easy to digest form showing how many people had positive and negative experience with RecoveryFix for Exchange Server Recovery. With that information at hand you should be equipped to make an informed buying decision that you won’t regret. 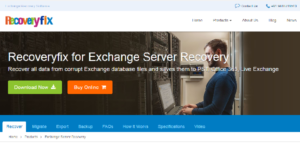 What are RecoveryFix for Exchange Server Recovery pricing details? What integrations are available for RecoveryFix for Exchange Server Recovery? If you need more information about RecoveryFix for Exchange Server Recovery or you simply have a question let us know what you need and we’ll forward your request directly to the vendor.